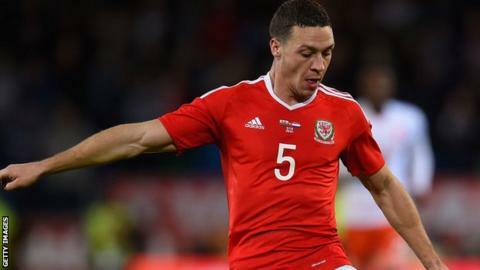 Wales defender James Chester admits his Euro 2016 ambitions are suffering by his lack of starts for West Brom. Chester played in Wales' 3-2 defeat by Netherlands, but has started only once in the Premier League this season. The 26-year-old does not understand why manager Tony Pulis has not played him more often. "To be playing for Wales I have to start for my club. It's impossible to play at this level and not be playing week in, week out," he said. "I don't think it's good enough to be playing for Wales when I'm not playing for West Brom." Former Manchester United trainee Chester was promoted to the Premier League with Hull and had two seasons in the top flight before joining West Brom last summer in the wake of the Tigers' relegation. The 26-year-old was part of a three-man central defence at Hull and also with Wales, playing a key role as Chris Coleman's side qualified for the European Championships next summer, but his rare Albion appearances under Welshman Pulis have come at right-back. "[Wales manager] Chris Coleman has been brilliant to me and that's nice to hear, so it's up to me to go back to West Brom and play. But I'm finding it difficult," he added. "When I signed [Pulis] said he knew I could play at centre-back but he wanted to use me at full-back.